A few former rubber-tappers (who extracted sap for industrial purposes) saw their profession gradually disappearing due to the arrival of petrol products and decided to raise poultry while still preserving the beauty of their forest. And so they developed a unique method of breeding which allowed them to move the poultry from place to place within the forest. This allowed them to maintain the undergrowth, to avoid cutting down trees, to use the base materials locally available without risk of running out and limit the amount of financial investment required. How did they do it? By creating the MARENSINE, a mobile henhouse that gave the poultry the ability to roam freely in the forest, wherever it chose. This was the birth of the traditional method of total freedom poultry farming in the Landes, a guarantee of the delicious, wholesome, naturally produced flavour that we still know to this day. 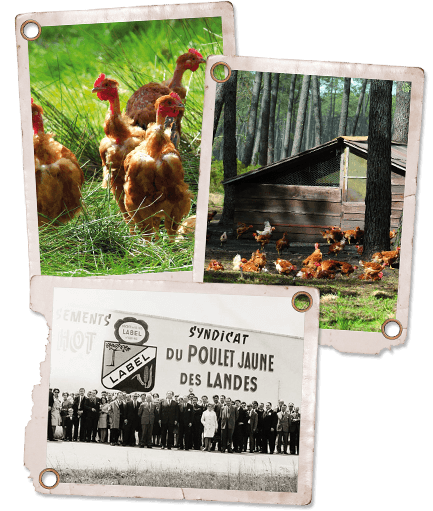 In 1959, the hatcheries, the farmers and a poulterer, Mr Albert Marie created the “Syndicat du Poulet Jaune des Landes”, to guarantee a stable income for the farmers and a consistent quality for the poultry. The establishment later became the Fermiers Landais. And so began the success of our delicious poultry. “Write what we do, do what we write”, the strict compulsory guide-lines of the first Label Rouge were written to continue the tradition, in 1965. TheLabel 001-65 was attributed to the corn-fed free-range Landes chicken. In 1965, our poultry was the first in France to obtain this now well-known “LABEL ROUGE”. 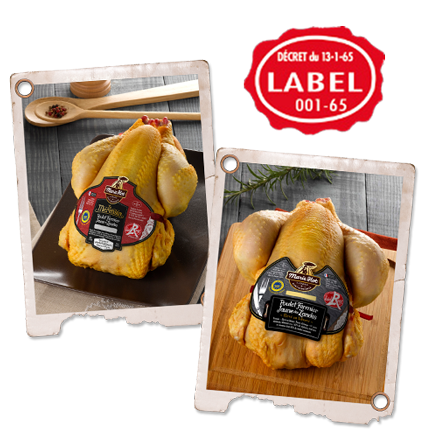 It guarantees the superior taste qualities of a product and the food safety approved by the French state, where poultry traceability is the most advanced. 50 years later, Marie Hot has been able to stay ahead and has an unmatched level of quality. • The choice of poultry: local breeders, total freedom rearing, animal welfare, healthy diet, pure and unspoiled territory. • Preparation: grading and sorting at all times on the production line, calibrating, trimming, manual paring of the cuts, giving priority to manual work.